The Memorial to Japanese-American Patriotism in World War II is an oasis of peace in the heart of the busy metropolis. A monument both to Japanese-American patriotism and struggle during the U.S. internment, the space invites the viewer into a contemplative experience. As you enter the secluded corridor of quotations commemorating Japanese-American commitment to the American ideals of equality and freedom, you can pause to review the names of soldiers who fought in World War II. A little further on, bear witness to the names of camps in which Japanese American citizens were interned as well as the number of internees. The monument reaches its dramatic peak in the sculpture of Japanese cranes intertwined in barbed wire. This sculpture rises above the monument, visible from several directions. The cranes symbolize struggle through restriction, and in this way the Japanese-American experience during World War II can stand in for all citizens' hardships. This moving memorial needs your help. Though beautiful and inspiring, it needs to be restored. Support for the memorial would enable consistent upkeep, as well as maintenance of the monument's grounds. The memorial bell, which would be a searing addition to the monument, is currently rendered inoperable, and the visitor's experience would be greatly improved if it were fixed. Furthermore, it seems that many residents and tourists overlook this monument. Your purchase of a memorial stamp will help raise awareness of this valuable American resource. Help us put the Japanese- American Memorial on the map, so that we never forget the sacrifice of Japanese-American soldiers and citizens to uphold our central values of freedom and tolerance. 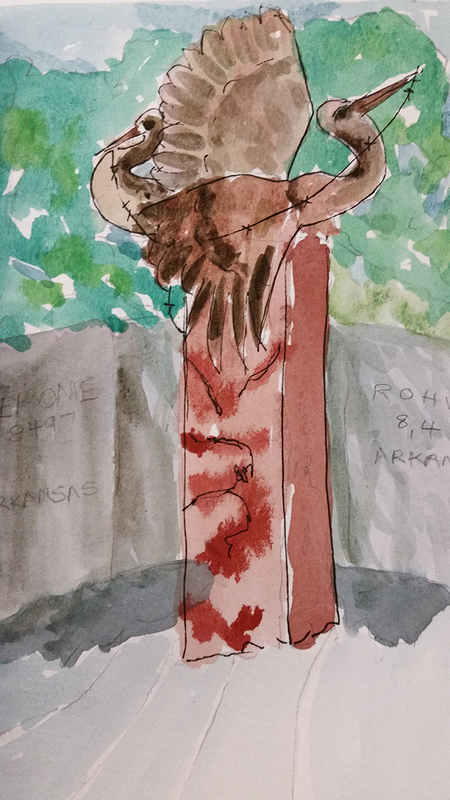 Watercolor by Carol Morris of Nina Akamu's sculpture in the Memorial to Japanese-American Patriotism in World War II. The 2000 sculpture depicts two cranes caught in barbed wire. 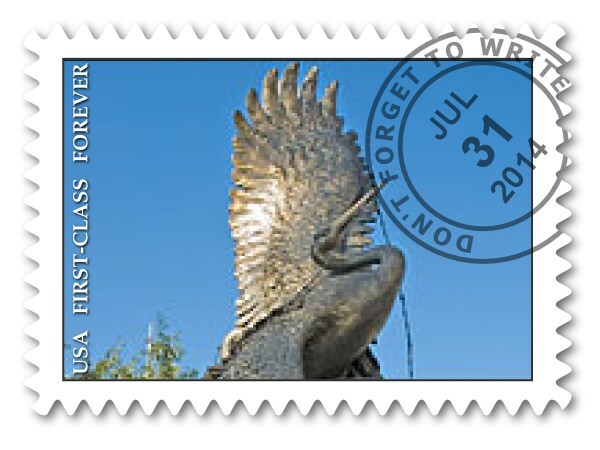 This design for a semi-postal stamp created by the group prominently features the Akamu sculpture. Semi-postal stamps are issued to raise money for charitable causes.